The other day we have seen the robot "car" collision avoidance BR23C from Nissan. The robot roll along with solitude and take a cue in order to survive in the wild CEATEC Japan. Yes, it's almost time for CEATEC again. 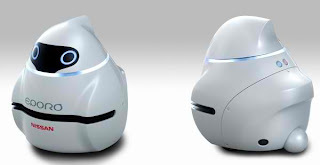 And robots that appear to look like a Nissan that is consistent with a new bag, as well as a proper name: Eporo. However, the robot now looks like a fish model, which not only provide greater peripheral vision (the offering of a pair of laser range search) to avoid obstacles, but allows travel in groups (clusters) were similar to the school of fish alone. Given such an idea, it is also possible that one day robots could be used to transport passengers and stay close together to reduce congestion on city streets. Thus, in turn, is expected to reduce the number of accidents on the highway.